The PerfeX is an all new blend of pure perfection between state of the art searing technology and extreme handle adjustability that accommodates every hand. Think of it as ErgoFitTM Technology on steroids. The all new PerfeX handle includes three and four finger articulating grip extensions that are easily interchangeable. Two thumb barrel sizes (both included) cover every preference and with five thumb barrel extension lengths (all included) your desired projection is easy to find. As is the case on all of our release aids, the thumb barrel on the PerfeX handle rotates 360 degrees and has both offset and center attachment holes for complete customization. 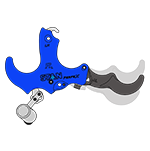 A patent pending innovation from Stanislawski that allows for easy and safe training. Learn proper shot execution and build confidence in your technique before ever shooting an arrow. Introduced in 2007, the Multi Positional Thumb Trigger offers an infinite number of knob positions to fit ANY position you desire. Tilt, projection, and angle are all adjustable. Speed is the name of the game and the VAMP sears have the fastest lock time in the industry minimizing the possibility of string interference. 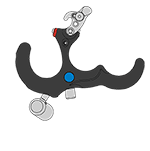 Not only is the speed faster but we have also expanded the traditional range of trigger tension adjustability from ridiculously light to absurdly heavy and everything in between. All this and the adjustability to set for zero trigger travel. No compromises, just exceptional performance. Like all of our sears, VAMP sears are made of enhanced 440C stainless steel then hardened to 60 Rockwell and finished with our proprietary polishing process. They’re designed to offer the same greasy smooth functionality as their predecessors all in smaller, melt in your hand handle designs. Like the name implies, silkpathTM sears are silky smooth yet their enhanced and hardened 440C stainless steel construction makes them brutally tough. They’re finished with our proprietary polishing process and set in place by experienced craftsmen to ensure years of reliable service. The hallmark of silkpathTM sears is their infinite adjustability. They offer huge trigger travel and tension adjustability without having to fumble with changing any springs. STAN’s® MOREXTM sears are the most advanced hinge based sears on the market offering an unmatched level of precision in the market pioneered by our namesake. The micro adjustable mechanism and two available clicker speeds (sold separately) make this the perfect back tension release for beginners and professionals alike. Like anything worth having, STAN’s® Smokin’XTM sears were a long time coming. Theory alone will not result in a design that is repeatable. Only painstaking craftsmanship and revision after revision will get you there and with the Smokin’ XTM sears we took our time. *Aggressive sweep versions have "DS" label at the end of handle name on the MOREX line. No release on the market is as crisp, comfortable, or as reliable as a STAN®. None. All of our sering mechanisms are made from enhanced and hardened 44OC stainless steel thne finished with our proprietary poslishing process. Therer is nothing as tough, reliable, or silky smooth as a STAN®. ErgoFITTM cross training technology is standard across all STAN® release aids. Each one is unique, yet all have a similar fit and feel. Multiple size and configurations offer archers the perfect fit. Handles come in medium or large, three or four fingers, and mild or addressive sweep patterns. Stanislawski® Archery Products is always at the fotefront. Whether it be from, fit, finish, or function. 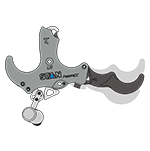 From the silky smooth cocking mechanism to innovative features like our Trainer Lock TM pin, nothing beats a STAN®. 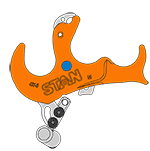 All STAN® release aids are made in the USA. In fact, the only thing not from the great state of New York is the anodizing which is done in pennsylvania. In 1970 Mel Stanislawsk invented the triggerless backtension release aid. Ever since, his namesake company has been leading the way in release aid performance and technology.